Kathleen Frugé-Brown is a painter, printmaker, and public artist with a long-standing commitment to imagery from the natural world. 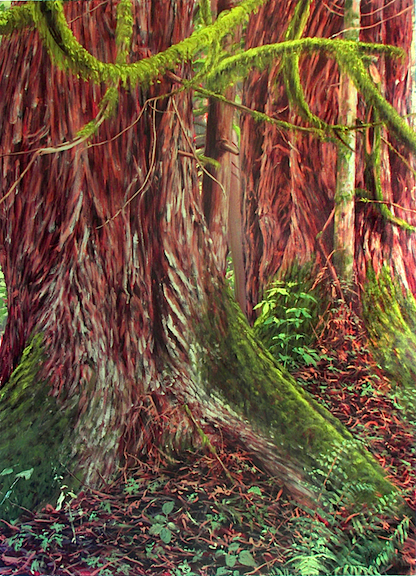 The foundation of her practice is plein-air oil painting, on the riverbanks and in the forest surrounding her Cascade foothills studio. 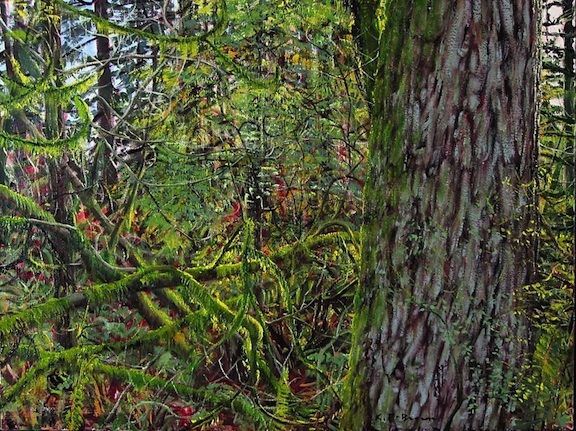 Kathleen loves the complexity and density of the natural world, and tries to make each brushstroke an exuberant and reverent response to nature. In recent years, Kathleen’s interest in creating public art has led her to translate her imagery into a variety of other media, including glass mosaic, epoxy enamel, and vitreous enamel on steel and glass. Her work is held in numerous public collections, and among her awards are a recent Pollock-Krasner Foundation grant and a Hauberg Fellowship from Pilchuck Glass School, in aid of her exploration of new media. Whether creating a public commission or working on a more intimate oil painting, Kathleen brings the same sense of purpose and passion to her workto awaken in viewers the feeling of connection and wholeness that she feels when she’s out of doors, painting. 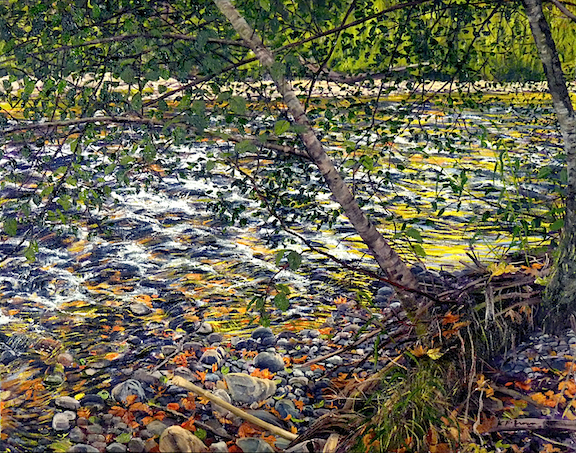 The river and forest surrounding Frugé-Brown’s Maple Valley studio are a constant source of imagery and nourishment to the artist. 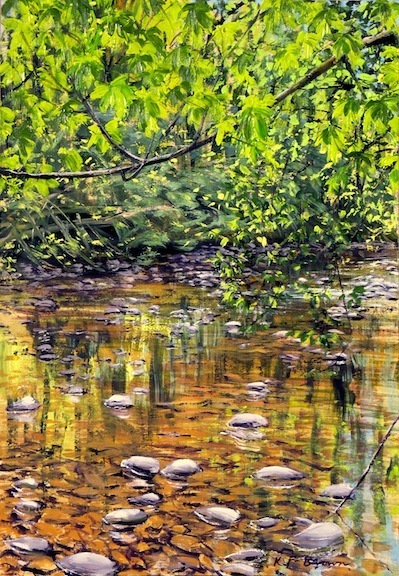 Her landscape paintings are all done outdoors from life, usually in oil on canvas. 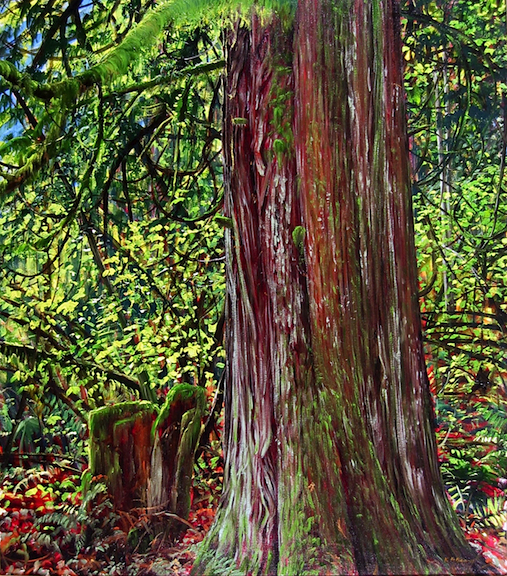 “One of the things I love about painting in the woods is there’s always another layer of things to be seen,” Frugé-Brown said. 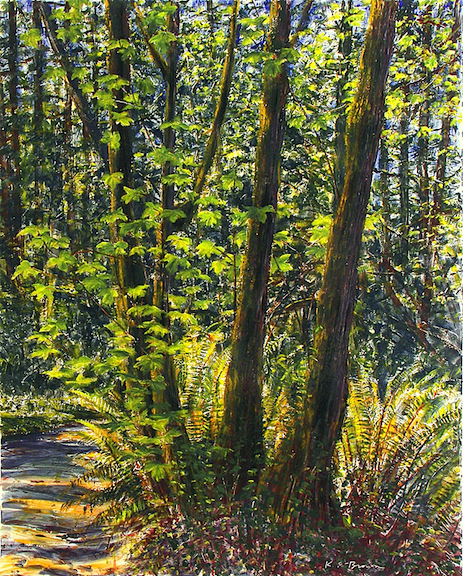 Take a walk now through the forests and thickets of the Northwest through the eyes of one of our region's most talented plein air painters. Her work is held in numerous public collections, and among her awards are a recent Pollock-Krasner Foundation grant and a Hauberg Fellowship from Pilchuck Glass School, to aid in her exploration of new media. 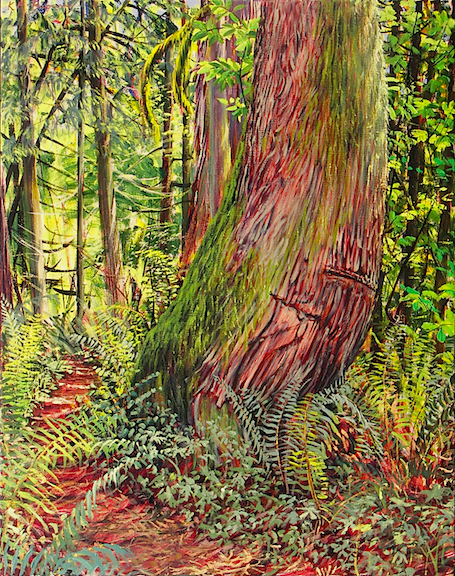 Whether creating a public commission or working on a more intimate oil painting, Kathleen brings the same sense of purpose and passion to her work to awaken in viewers the feeling of connection and wholeness that she feels when she’s painting outside. She strives to make each brushstroke an exuberant and reverent response to nature. Kathleen's woodblock, linoleum and mono prints will soon be displayed here.